The incident is the latest in an ongoing series of confrontational military encounters at sea and in the air, and takes place as the US has increased its naval demonstrations in the Mediterranean region. For the first time in some years, two US Navy carrier strike groups were active at the same time in the Med. On June 2, the carrier Harry S. Truman — whose escorts included the Graveley — passed northbound through the Suez Canal and, on the following day, began combat strikes against ISIS targets in Syria and Iraq. The Truman apparently has wrapped up combat operations and was in port at Souda Bay, Crete last weekend. US officials on Tuesday would not confirm the ship’s location, but she is believed to be preparing to return to the US at the end of a seven-month deployment. On June 13, the Dwight D. Eisenhower strike group entered the Mediterranean through the Straits of Gibraltar at the beginning of a scheduled deployment. After a visit to Naples, Italy, aircraft from the Eisenhower began flying combat strikes against ISIS earlier today. A US defense official said there was more to the Gravely incident than just what was seen in the video on YouTube. The entire encounter, the official said, lasted more than an hour and took place entirely in international waters. According to the official, the Gravely was escorting the Truman while the Russian frigate was observing operations and maneuvering too close for comfort to the carrier, restricting the flattop’s freedom of maneuver. 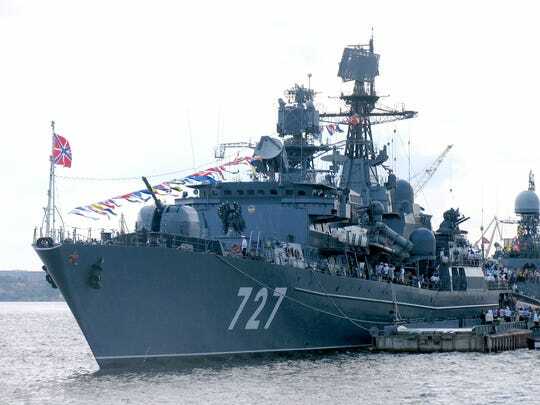 “Gravely was operating astern of Harry S. Truman, and assessed that 777 was intentionally trying to interfere with Harry S. Truman operations,” the official said, referring to the Russian frigate’s side number. The destroyer maneuvered to place herself between the Yaroslav Mudry and the Truman, but the Russian closed to within 315 yards, the official said. At that distance, “the interaction was assessed as unsafe,” the official said. “777 had raised day shapes “ball-diamond-ball,” which is the international signal a ship displays when restricted in her ability to maneuver, when she took position two nautical miles off Gravely’s starboard quarter. Then, 777 repeatedly asked Gravely over VHF radio to maintain a safe distance, while 777 continued to maneuver to get closer to Gravely. “As Gravely changed course and speed, 777 also changed course and speed. The maneuvering demonstrates that 777 was not in fact restricted in her ability to maneuver, and was thus intentionally displaying a false international signal. “Gravely assessed that 777 was intentionally trying to interfere with Harry S. Truman operations. That a maneuvering incident could grow into something more serious remains a danger, the official added. Earlier this month, the movement of the US destroyer Porter into the Black Sea on June 6 prompted an unusually high level of Russian protest. The US and a number of European navies regularly send ships into the inland sea, where low-level exercises with the navies of Ukraine, Romania and Turkey are the typical activities. Several media outlets reported that the Russian government threated some sort of unspecified response to the Porter’s visit. The Porter returned to the Mediterranean after 13 days in the Black Sea. 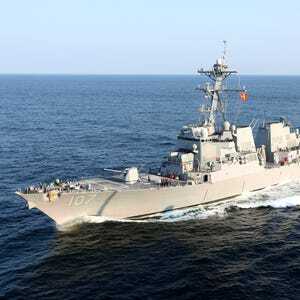 The Porter and Gravely are Arleigh Burke-class Aegis destroyers displacing around 9,000 tons, able to hit speeds more than 32 knots. The Yaroslav Mudry is a Project 1154 Neustrashimiy-class frigate displacing about 4,200 tons, with a speed of about 30 knots. The ship originally wore the side number 727, but appears to have recently changed to 777.